The perfect shade of grey…you’ve been studying your cadavers again. Yep, mostly members of the NSW PLP. Ha ha, a genuine lol moment here! I am analysing this cartoon for vce english and would like to know whether the man reading the news poll is a specific member of the labour party or just represents a powerbroker. Just for the record, it’s “Labor Party” not “Labour Party”. It started off as Labour, but was changed to Labor int he early 1900s to identify with the American labor (American spelling) movement (I think this is the case – best google it if you’re putting it in your report) and thus endeth the lesson. 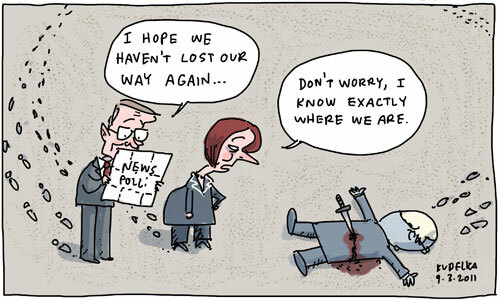 …and the guy reading the Newspoll is Wayne Swan.